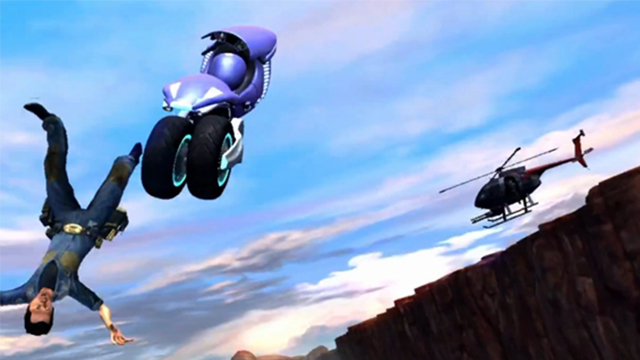 With all this Xbox One news, there’s some happiness in the form of a motorcycle at least. Twisted Pixel has announced that their newest title, LocoCycle will be coming to Xbox One, in a press release today. Who knew it was a next gen game all along?! But fear not, there’ll be an Xbox 360 version. However, it’ll be coming at a much later date. So now we know of two launch titles for the Xbox One so far. LocoCycle is the next game from the Austin-based studio Twisted Pixel, creators of ‘Splosion Man, The Maw and Comic Jumper, stars a karate-trained motorcycle named I.R.I.S. She becomes self-aware and escapes her organization with Pablo the Engineer hanging by her wheel. I.R.I.S. is on a search for freedom on the open road but not when spies try to take her down. We have a preview up that Max did from PAX East that he dubbed as the ‘Short Circuit’ of games. A lot better than Citizen Kane. It’ll also be on show at E3 which Stick Skills will be at.